I am a professional musician who currently plays for two bands a Nottingham based bands a metal band ‘Corruption Policy’ and acoustic duo ‘The Hair’. I have played in many bands over the years covering a range of styles from instrumental guitar to Jazz-fusion. These experiences have seen me play all over the Nottingham area and also to travel over seas to Germany which gave him the opportunity to give clinics to school children as well as performing daily. I am also a regular visitor to open mic nights/ Jam sessions, which is a fun and relaxed way to perform songs and meet other musicians. 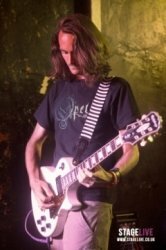 I teach all ages and abilities whether it’s a child picking up a guitar for the first time or a seasoned player looking to further develop their playing. I have experience in teaching students currently in higher musical education and offers support in their daily learning. I will regularly attend student’s gigs and offer advice in ways to better their performance and gain more confidence in live situations. I tailors every lesson to you and what you want to learn. I understands everyone learns in different ways and at different speeds. Whether you are looking to play your favourite songs, learn a new style, improve your technique or take formal exams every lesson will be especially for you.